This Kleenex Hand Sanitizer comes from one of the most trusted brands on the market, Kleenex, and is formulated to provide fast acting, effective antimicrobial action that kills 99.99% of the most common germs that can cause illness. Moisturizing aloe and vitamin E help hands retain moisture even after repeated use. The fresh fruit scent is pleasant and never overpowering. The 8-oz. pump bottles are perfect for keeping by restroom sinks and countertops. These C-fold paper towels from Kleenex are soft and highly absorbent, providing efficient hand-drying and less waste. Kleenex C-Fold Paper Towels meet EPA Standards and are FSC and EcoLogo certified. Packaged in 16 - 150 Sheet Packs, they allow for easy storage. 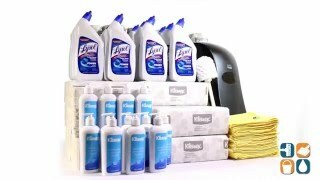 Compatible with Kimberly Clark 09905 Universal Folded Towel Dispenser also sold in this bundle (see below description). This folded hand towel dispenser from Kimberly Clark accepts Scottfold, multi-fold and C-Fold towels (sold with this bundle) without adapters or inserts. The contemporary design and smoke/gray color creates an upscale look in any restroom. The translucent cover allows for an easy view inside so you know when refills are needed. Includes mounting screws. Dimensions: 13.3" x 18.9" x 5.9"
These microfiber cleaning cloths are designed with scrubbing strips and high quality knitting for better absorption and debris pickup. Double-finished edges provide durability and shape retention for up to 500 washings. Color coding helps to prevent cross contamination. Rubbermaid Microfiber Bathroom Cleaning Cloths are hypoallergenic, non-abrasive and lint-free. This powerful toilet bowl cleaner cleans, disinfects and deodorizes toilets and urinals. The thick liquid formula clings to the bowl for longer contact and a more thorough clean. Effectively kills staph, pseudomonas, E. coli, HIV-1 and other harmful germs. Designed with an angle neck, Lysol Toilet Bowl Cleaner, gets under the rim easily, dissolving stubborn stains on contact and disinfecting the entire bowl. Can be used in conjunction with the Rubbermaid Toilet Bowl Brush also sold in this kit (see description below). comes individually wrapped so rolls stay clean and hygienic while in storage. Meets EPA standards and is FSC and EcoLogo certified. With 60 rolls, you'll be sure to have some on hand when refills are needed. Rubbermaid designed this toilet bowl brush for easy cleaning. Stain and odor resistant, this bowl brush is constructed with a plastic handle and polypropylene and crimped polypropylene filles. Durable and made to last. 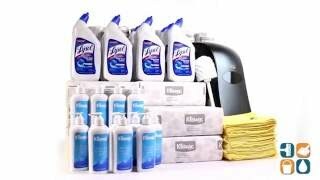 Can be used in conjunction with Lysol Toilet Bowl Cleaner also sold with this kit (see description above).